Someone asked my daughter, Kristin, about what she believes. I love her answer. Thought you might enjoy it also. She is my oldest and 16 years old. This is the last in the series the ART of Homeschooling. When I first began homeschooling it was a very mommy centered approach I am afraid to admit. I excelled in school and academics was a high priority. I picked things up easily and progressed rapidly. Math was my strength and I eventually graduated from the University of Michigan with a degree in Computer Science. I just assumed that my children would fit into that mold and we'd all get along just fine. Wrong. Through trials and many tears I realized that I could not school my children in a way that had worked for me. This was all made very real to me one day in the early years, when I was teaching my daughter a math concept. I was growing increasingly impatient at her lack of understanding. Finally she responded in frustration, "Mom! You gotta get that I just don't get it!" I finally got it. School was not going to be the same for them as it was for me. As a new homeschooler, I spent many hours pouring over catalogs deciding which curriculum would work for us. I read many books and went to many conventions. What was missing was a clear understanding of the goal. It's like taking a trip and planning all the stops with out knowing what the destination is. This worked for a while but as more children came of school age the distractions were greater and the achievements less obvious. So back to the drawing board I went. Crying out to God, I asked HIM to show me how to teach these children HE gave me. I realized that I was using a very institutional model in a very non-insitutional setting and expecting my children to perform rather than learn. As I studied God's word I realized I was giving them alot of knowledge but very little wisdom. Facts are wonderful to know but wisdom is using these facts wisely. Rushing through assignments for the sake of getting them done is not an education. I began to devote more time to training and less time in "formal teaching". Quickly, our home became much more relaxed with a more realistic pace. I didn't stress if we didn't do math one day so we could catch up on laundry. I took time out to train the children in how to resolve conflict so that they weren't always running to me. Training and teaching became a part of family life not the center of family life. Academics didn't take over our lives any more it became a part of our lives. I will explore teaching and training in further detail as this blog moves on. For now, however, let me just conclude with a statement my son made to a friend of mine when asked about what he learned in school. He replied, "School is life and life is school you never stop learning." I was once a spelling bee champ and also a spelling bee loser. I have to say I learned from both. If you are new to this series. I am talking about the ART of Homeschooling. Homeschooling involves three significant relationships that need to be nurtured in order to maintain order in our personal lives and achieve the success we desire. First, is our relationship toward Christ. As a Christian, I desire a deeper walk with the Lord. This means daily seeking Him for guidance and fellowship. When I first became a Christian I was told that the best and most important time of the day was my time alone with God. It seemed so easy back then. I would just find a quiet place in the dorm early in the morning and read and pray. I am thankful for those times of fellowship with the Lord. In the midst the liberal chaos of university life I was able to focus on true wisdom and knowledge. After I was married and became a mother, however, just finding a quiet place became difficult and getting up early after being up all night seemed nearly impossible. Over time I realized that God is not boxed in to a time of the day. For a while, nap time provided a time of quiet in which to read and pray. Now that we're all sleeping thru the night again I am struggling to get back into the morning routine with the family. I also have come to appreciate that serving my husband and family is also an act of worship to the Lord. Don't misunderstand, I am not saying I worship my family but that by doing the work God has called me to do it is just as much a form of worship as singing a praise song. I would love to just relax in a quiet place and read, pray, and worship but I must also do the things that HE has called me to do. A relationship with Christ is dynamic and growing. The fruit of a vibrant relationship with Christ will be evident to all around you. Especially, in the next two areas my husband and children. The second is our relationship to our husband. It is easy to let the marriage take a back seat as the demands of mothering and homeschooling are so much more obvious. But in the long run this is a costly decision. The book of Esther provides great reading about the attitude of various wives and the consequences. It was because Esther provided undivided loyalty to her husband that he respected her. Her example, has become my example. This may mean that you become less busy with outside activities to do the things necessary in the home to meet his needs. This was hard for me. Homeschooling provides many educational opportunities outside the home. I didn't want the children to miss out. But in the end I realized that we were all missing out if when we arrived back home there was chaos. It may cost you a few experiences but a happy home is priceless. Lastly, is our relationship with the children. If there is just one thing I have learned in my years of homeschooling it is always be their mom first. Don't sacrifice a relationship for the sake of a textbook. If you see your children's hearts drifting take the time necessary to pray and examine the causes. It could be boredom, tiredness, lack of understanding or communication, or something entirely unknown. It is tempting for me to look at my children and blame them but many times it is me. I often react to situations in a critical way. My children pick up my critical attitude and react to it. (This get's back to attitude) At this point, it is best to repent to the Lord and the children. Children are incredibly quick to forgive and my repentance sets the tone for their ability to do likewise. Early on I have learned that homeschooling is more than just academics. It is nurturing these relationshipships so that we all may grow in the wisdom and knowledge of our Lord. Don't sacrifice heaven for Harvard. Click here to read "T" is for Training. Jealousy is not as easy to identify as bitterness as a contentment robber. But it can bring a homeschool mom to tears in no time at all. A homeschool magazine arrives in the mail (inevitably on the worst day of the year) and you see a smiling family with a dozen children all playing the violin. Immediately, anxiety sets in as you look around and see your family still dressed in their PJ's playing spoons on each others head! You may not exactly be jealous of that family but you sure feel alone in your "obvious" failure. Comparing one homeschool family to another can be dangerous. When we start to put pressure on ourselves to comform to this image we fall into a trap. If not quickly dealt with, it could derail our whole home life and cause us to make unwise choices. Usually the inevitable result is the children go back to another school situation because we think we aren't doing enough. This is a life time journey. A marathon, if you will, not a sprint. We are told in scripture not to compare ourselves one to another. So, I would encourage you to pray and establish short term goals for your family so that when you feel the need to compare yourself it will be with the vision God has given you and not someone else. Your family may never make it to the cover of a homeschool magazine but you will have the joy of walking faithfully with the Lord and content that your are doing the unique work HE has called you to do. And in the end you will one day hear these words, "well done my good and faithful servant enter now into the joy of my rest". Thanks to PalmtreePundit for linking to my blog. I encourage you to check her blog out. It has alot of great reading and links. She's also a fellow homeschooler from Hawaii. Hopefully I'll figure out how to blog as well as she does someday! When God spoke about my attitude being the first priority I began to do a scriptural search on what my attitude was to be. The first scripture I landed upon was Phillipians 2:6 which states "Have this attitude in yourselves which was also in Christ Jesus, who although He existed in the form of God, did not regard equality with God a thing to be grasped but emptied Himself, taking the form of a bond-servant." So my attitude was to be that of a servant. This didn't seem much of a new revelation to me. Jesus laid down HIS life so I must also. As a homeschool mother serving just seemed like it came with the territory. Being a servant is one thing but what is my attitude supposed to be as I serve? In 1 Timothy 6:6 we read "Godliness with contentment is great gain." Serving our family and homeschooling our children is a very noble and Godly pursuit but is our heart content while we are serving? This scripture shows very clearly that great gain is from serving with contentment. If serving isn't hard enough some days God is clearly saying I must do it with contentment. Contentment isn't just being cheerful. It is a heart at peace knowing that what your are doing right now is exactly what you should be doing over any other activity. Meaning given any choices this is what you would choose. Contentment robbers come in various forms but two that are particular to homeschoolers are bitterness and jealousy. Bitterness has at it's root a self-centered heart. We become bitter when we feel as though we are being unjustly treated or neglected. The easiest target of our bitterness is our husband. We read a book about how our marriage or family is "supposed" to be and when we look around we see a family that falls way short. Of course, this is all our husbands fault if he were just...more godly,...home more often....a bigger help....more nurturing...more spiritual...our home would not be this way. When I find myself becoming bitter, I must turn my eyes from the book and look back into THE BOOK which states in James, "fixing our eyes on Jesus the author and finisher of our faith who for the joy set before Him endured the cross". My husband is not perfect just as I am not perfect and when I begin to get bitter it is because my focus has shifted from Christ to my own selfish ways or desires. This bitter root, if allowed to fester, will rob us of the contentment we need to carry out the tasks of our calling as homeschoolers. I will in my next post turn to the jealousy as an attitude robber. Early on in my homeschooling journey I began to ask God for a vision that would keep me going when the trials came. I did not want to abandon the call God had given me to homeschool when times got tough and I knew that only a divine purpose from God could sustain me for the long haul. When we seek the Lord, HE does not disappoint us. He gave me a purpose in the form of an acronym ART. A is for Attitude, R is for Relationships, and T is for teaching and training; thus the ART of Homeschooling was drafted. That is the way I am to structure and prioritize my life. In the coming days I will go into these three parts. It was very tempting when I first began to homeschool to think about curriculum. After all wasn't that what homeschooling was about? Quickly, I learned however that even the best curriculum cannot be taught when my attitude is wrong or when there are conflicts in the home. To put Teaching before Attitude or Relationships would be to create TAR a stickly mess that would not be easy to work with. If I put the Relationships before Attitudes, and Teaching I would ended up with self-centered little RAT's. I realized everything was not to be centered around the children, or their "fun". I wanted a home centered on Christ and that meant one way. ART. With the priorities in that order, my days and life will be ordered in such as way as to glorify the Lord and put first things first. This vision has sustained me the last 10 or so years and I hope to continue on as long as God allows. Yes, I know that this is Germany but this could happen here too if homeschoolers don't stay on top of things. For those unaware, our educational system is slowly creeping in a very socialist direction. National testing, job readiness, and career planning are all patterned after the German system. The liberal "touchy feely" stuff too! While I do support most of President Bush's agenda I am not a big fan of No Child Left Behind because in the end it will leave the homeschooler behind. This is not the paranoid rhetoric of a fanatic but the documented words of many in the educational establishment. Don't take my word for it read here. As I try to keep up with my home, the children, and life in general I realize that there are never enough minutes to get work done. Oh, what to do? Life is so full of the unexpected and then there is my own impulsive nature. I wake up with the best of intentions to get things going but then a snow storm hits and out the kiddies go to shovel the snow for the neighbors. A good deed done and a chance to earn a few dollars but oh what about those plans. Layed aside once again. Sigh! As I begin my 16th year of parenting and almost as many years of homeschooling I have learned to expect the unexpected and go with the flow a bit more than in the early years. That helps with the central theme of our home life which is to "love the Lord our God and Serve others". God moves in unexpected ways and so must I. The anxiety and insecurity now that's another matter. Most people I encounter would not think me insecure and in my heart I am not really but catch me at the wrong moment (usually after meeting a Latin speaking two year old) and I begin to question everything I am doing. But God quickly moves back in to help me see that I am raising my children on HIS timetable and not my own. So as a ponder this year and how many more God allows for me I know that I must continually "keep my eyes on HIM" for when my eyes begin to wander so too my heart. As for the work, I best get back to it atleast until the snow plows clear the roads and we can go sledding! People have often asked what our day is like. So here goes. Dad wakes everyone up at around 6AM. We do bible reading individually and then read a chapter from the book of Proverbs. After that it is showers, breakfast, and on to the rest of our day. The children have weekly assignment charts that they follow. They usually do reading, math, and writing in the morning. I am available to help with these assignments and also play with Elaina (our one year old). But that only works if it is Monday, Wednesday, or Friday. On Tuesdays I take the boys to a Sr. Citizen wood carving club. We are the only youngsters there and it is alot of fun. On Thursdays it is piano lessons. In the afternoon, we do family reading and discussions. We are currently reading the Young Tom Edison and The Fallacy Detective. Along with this there is also a discussion of what everyone is reading on their own. But if it's Wednesday we all go to the ice rink and skate for a few hours. And if it's Friday it is time for Homeschool Band (for the older 5 and a nap for Elaina and mommy). We use a literature based approach to homeschooling (Sonlight). The children seem to enjoy the variety of literature and I read them too! This seems to work well for us. Along with the life of school there is also our home life mixed in. Between critical thinking there is usually a boat load of critical folding. We assign chores as needed using a card system and a bulletin board. My husband works from home as a financial planner. See http://www.libertyfinancialplanning.com/AboutLiberty.htm for details and a family photo. In our spare time, we do Civil War Re-enacting. 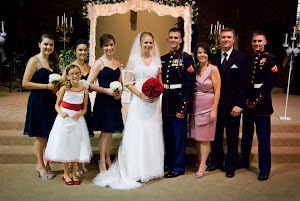 see http://www.civilwardads.com/AboutUs.htm for details and another family photo. When we are not schooling, reenacting, or folding laundry, we are usually sleeping.